Tree of Jesse (detail) St. Michael’s Church, Hildesheim, Germany. This detail of an enormous ceiling painting, ca. 1230, shows Mary at the top of the Tree of Jesse. Dear Lord, as I come before you this morning, my spirit is filled with thanks that you have given me a life and filled it with meaning. Knowing that you have a purpose for me is such a gift as I cannot express; even when the world or my own thoughts fill me with feelings of worthlessness, I can turn to you and know, fully certain, that you are in charge and have filled my existence with meaning and purpose I cannot fully understand. Lord Christ, you promised that if we love you and obey your teaching, you and the Father will make your home with us; I declare my love for you; and there is nothing I want more than to have you live with me, present in my life. Help me to follow your teaching in every way; for you have given us grace, that by your death and resurrection, we may be perfect before you. Accept my love and be with me, today and always, I pray; not by my merit, but by your grace, oh Christ, oh one true God: Father, Son and Holy Spirit. Dear heavenly Father, my thoughts and prayers are with all who have lost the use of their body or mind, in some important way: those of us who cannot move, those who cannot walk, who cannot see or hear, whose minds are not clear: for all of us who have lost some function that others of us take for granted. And I count myself among them, for who among us will not face such tribulations as we grow older? I pray that those of us so afflicted may know you, Lord Christ, and that your Holy Spirit may be strong in us, to give us comfort in the inconvenience, the frustration, and often the embarrassment we might suffer. Heal us, where it is your will, Lord; and for those of us who cannot be healed, let us know with complete confidence that we are truly whole. Bring to all of your children full comprehension of the freedom and joy that await us, after the short trial of this life is ended, and we all come to perfection together. Now may the God of peace who brought again from the dead our Lord Jesus Christ, the great shepherd of the sheep, by the blood of the eternal covenant, equip us with every good thing that we may do His will, working in us that which is pleasing in His sight; through Jesus Christ, to whom be glory for ever and ever. 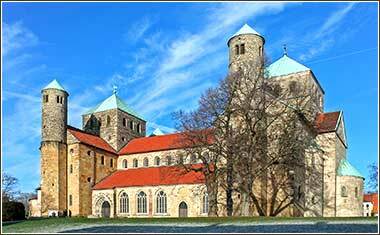 St. Michael’s Church in Hildesheim, Germany. Without doubt one of the finest Romanesque churches in the world, dedicated in 1022 A.D. 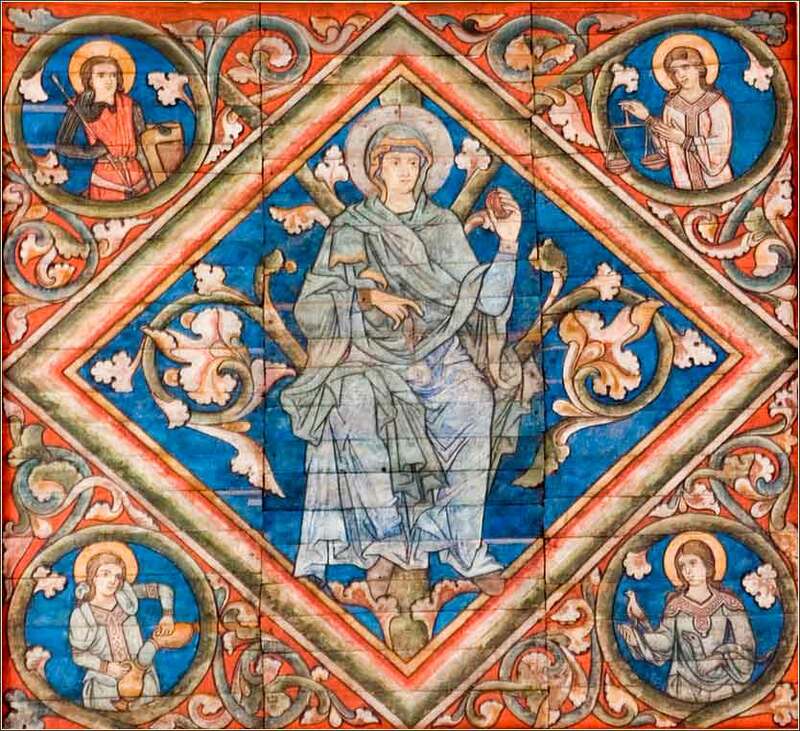 The top graphic is part of a ceiling painting, which covers the entire central vault. 10 For whoever by works is under curse is. For is written, “Accursed all who not persevere in all the writing in the book of the law to do them. When Paul speaks of a “curse”, here and in Ch. 1, it doesn't mean what we commonly think of when we hear the word. Specifically, it is used to indicate God's disfavor towards a person who is guilty in His eyes, someone who is not in conformance with a covenant of salvation. At least in the two instances we have seen so far, being “cursed” does not preclude salvation, if one changes whatever brought it about. Paul uses the concept of a “curse” to indicate a systematic course of sinful behavior that includes beliefs, where the beliefs themselves prevent forgiveness and salvation. So we see that anyone attempting to become justified before God, by compliance with the Law of Moses, is engaged in a course of behavior that will inevitably result in God's judgment. The logic of Paul's argument in this passage is not spelled out. His quote is downright puzzling: “Whoever follows the law will live by the law,” and “cursed is everyone who does not confirm the words of the Law by doing them.” It sounds like he is arguing the opposite of his previous point. But by showing that one who relies upon the Law must follow it, he demonstrates that those who follow the Law will die; for nobody, except Christ, has ever followed the law perfectly. So we read this to mean that 1) To find eternal life under the covenant of Moses, one must confirm the covenant by perfect obedience to the Law, and 2) by implication, nobody can do so. But is this actually implied, using the stringent definition? We spent a lot of time discussing the difference between “implied” and “inferred” meaning in the Bible, and specifically the need for a hard and clear Scriptural passage to support any implication we might assert. In fact, the statement that “it is impossible to follow the Law perfectly,” which many people take as a given, is remarkably hard to find spelled out in Scripture. The only passage I can find to support the notion, clearly and intentionally, is Romans 3:23: “[A]ll have sinned and fallen short of the glory of God.” It makes me uncomfortable that such a major doctrinal issue hinges on a single passage buried in an epistle; but on the plus side, the context of the passage speaks directly to the idea that no person has been able to follow the law. Still, although Romans 3:23 states that all have sinned, it does not say that it is impossible not to sin, or impossible to follow the Law of Moses; and I have not found any passage that clearly and explicitly says this. I would be very happy if anyone could point me to such a passage. But until we find one, we will have to admit to an inference; that the impossibility of following the law is at least in part the product of fallible human thought. The inference is incredibly strong, but still, it is inference. Matthew 6:14-15: For if you forgive others their trespasses, your heavenly Father will also forgive you, but if you do not forgive others their trespasses, neither will your Father forgive your trespasses.